Do you think that by THIS weekend we could have spring, please??? Last Saturday was just kind of ridiculous, snowing all day, just as we had melted a substantial portion of the winter’s snow. I hear by Friday it will be in the 60’s. NOW we’re talking! With Passover beginning on Friday and Easter on Sunday, there will be many family celebrations coming up. 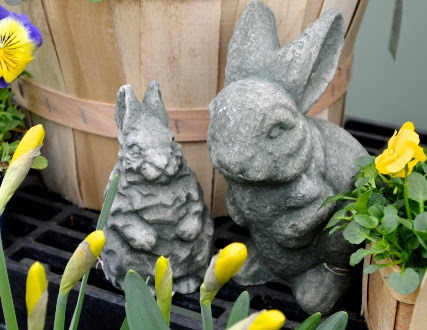 It’s time to get your spring on! Stud your pots with our own fresh cut pussywillows and add some pansies- they are hardened off and ready to withstand the cold night temperatures we are still having. Saturday or Sunday, you can sprinkle those gorgeous breadseed poppy seeds right on the ground TODAY- they need that chill period to germinate. The last batch of them arrived Tuesday and we are finally fully restocked. Are you looking for a very special, unique gift for the upcoming holiday weekend? We are now creating our signature living Easter baskets. 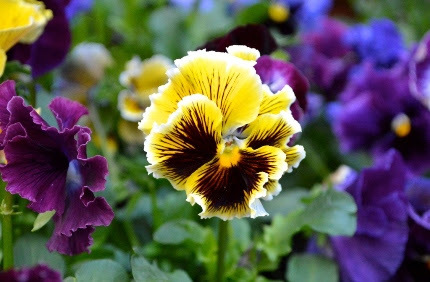 These are baskets filled with pansies, spring blooming bulbs, and other plants that can later be put in your garden. Of course they are embellished with cut pussywillows and pretty bows. 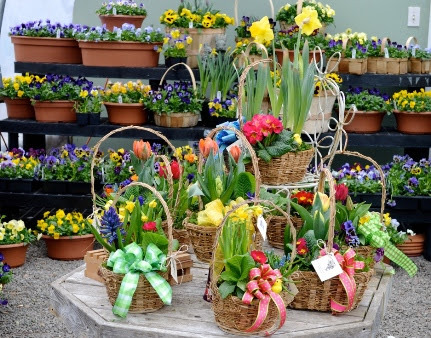 We gladly take orders for these garden baskets, and we are open Friday and Saturday our regular hours. We ARE closed on Easter Sunday to allow our staff to enjoy some family time before spring really gets crazy. 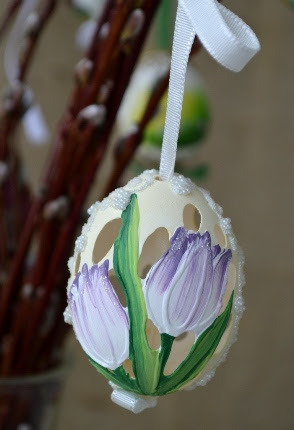 Hand painted eggs from Austria are hanging from every surface and make very special gifts. Start a tradition, begin a collection for a new homeowner. Then, each year, it’s easy to add to the joyful display. 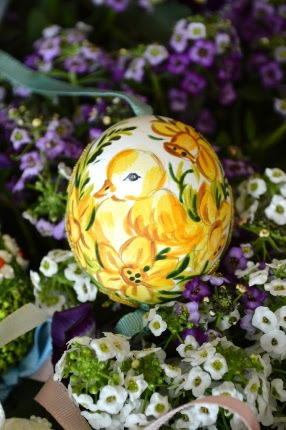 You will find, as I do, that people are simply enchanted with the detailed hand work that goes into our eggs. 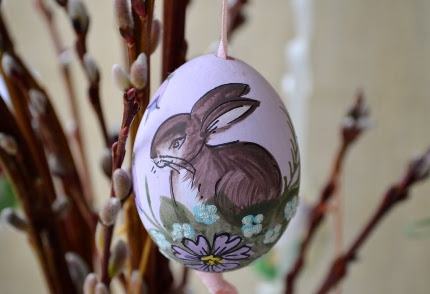 Seeds are also another great alternative for embellishing Easter baskets. You give the gift of a garden that will be enjoyed for months to come. For the kids, check out our sticker and coloring books, all with nature, garden, or fairy themes. 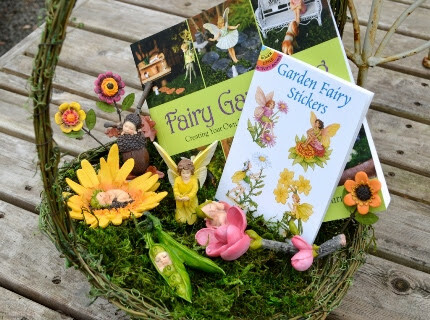 We can also help you put together a fairy garden themed Easter basket- what fun it would be to play with as the weather warms up. perfectly with ‘Lucie’s Pink’ and Global Warming mums. In my design assistant Rebecca’s Hebron garden, it is NOT eaten by deer- everything else is. In MY garden, it grows and flowers in the roots and shade of a large tree. 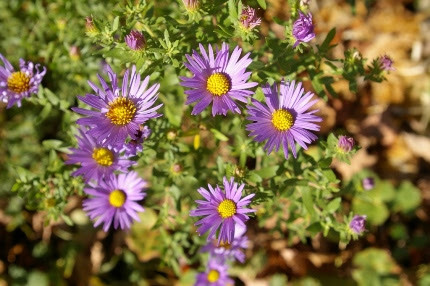 If you plant a field dug clump in early May, you will have an established stand this fall. All you have to do is give it one hard pinch in June. Click here to download our Natureworks Field Dug Plants order form and if you are interested, place an order soon. Quantities on these plants are very limited. 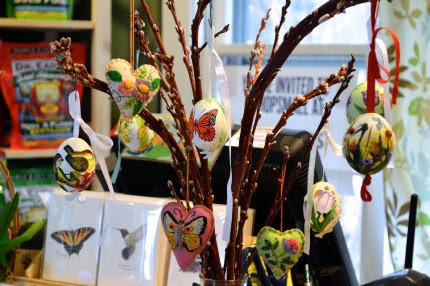 We are filled with creative, unusual, nature-inspired ideas here at Natureworks. Spring IS here and we want to help you feel the exhilaration and create a true celebration for your friends and family. P.S. Hot off the press! We now have a handout on Growing Tender Bulbs, Corms, and Tubers. If you have wanted to grow dahlias and caladiums and tuberous begonias but have been unsure of how they “work”, click here and download this new handout. 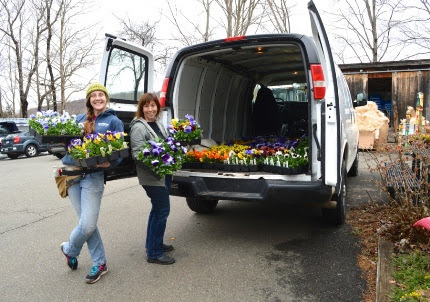 Then hop in and grab some bulbs and get growing! 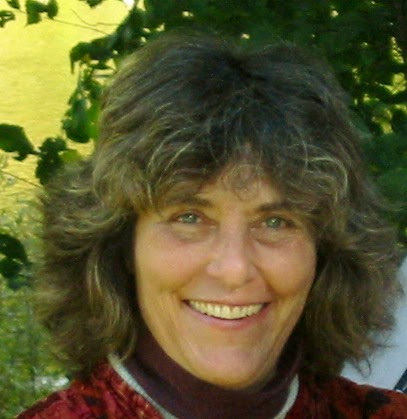 This entry was posted in Blog, Weekly EMail. Bookmark the permalink.